Low Flow Shower Heads Conserve Water! A low flow shower head is a great way to conserve the environment and our water supply! Today, more than ever, there is an increased awareness of how our everyday choices affect the environment. Energy efficient appliances in our homes not only save us money but also use less energy and help us conserve our environment. One way you can help the environment in your home is by installing a low flow shower head! This is an easy first step towards making your home more environmentally friendly, considering that showers account for around 30% of overall home water usage. As recently as a few years ago, shower heads typically delivered water at a rate of around 5 to 8 gallons per minute. Today, the standard for a regular shower head is around 2 and a half gallons per minute. Low flow shower heads will typically deliver water at around 2 gallons per minute. That means you could potentially reduce your household water consumption rate by 40% or more! Not only do low flow shower heads conserve the environment, they also conserve your wallet. Your monthly water bill will decrease and provide significant end of the year savings. 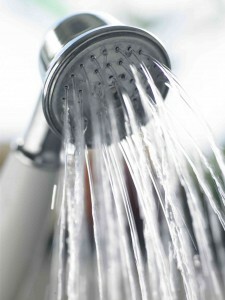 Cutting your water usage also cuts your energy usage, since you won’t be heating as much water for your showers. Cutting your energy usage, in turn, cuts carbon dioxide emissions which also helps benefit the environment. Low Flow Doesn’t Mean Low Pressure! Just because a low flow shower head uses less water doesn’t mean you’ll be getting a lower quality shower. When low flow shower heads first arrived on the scene they reduced the water pressure down to a trickle. Today’s models use a mixture of smaller apertures and air to increase the pressure and create a better shower experience. This makes low flow shower heads a more appealing option nowadays, and with the amount of money you’ll save, saving the environment has never felt so good! This entry was posted on Wednesday, October 5th, 2016 at 7:02 pm. Both comments and pings are currently closed.